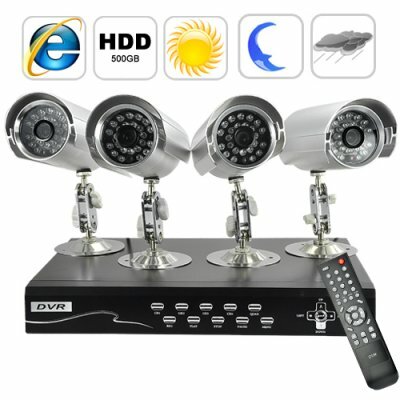 Successfully Added Security Camera + DVR Kit - 4 Cameras and Surveillance Recorder to your Shopping Cart. Full Surveillance DVR kit complete with four Night Vision Security Cameras and 500GB hard drive for video recording. This is the ultimate security camera kit to create your own safety zone. This high quality kit set contains everything you need to setup a CCTV security system at your home or office and it even has internet connectivity for remote access. 4 Cameras: These are high quality night vision IR CCTV cameras with 1/4 inch Sharp CCD lens that have high quality image and wide viewing angle. With aircraft grade aluminum construction and sliding hood, these waterproof cameras are design to stand up again snow, dust and rain. The intelligent design light sensor in the security cameras will automatically turn on the 24 infrared (IR) night vision LED's when darkness arrives. DVR Unit: Runs on a stable embedded linux system and a pre-installed 500GB SATA HDD to record up to 500 hours of surveillance footage, this DVR is ready to start using as soon as you take it out of the package! You can connect the DVR to your monitor and watch the surveillance video (you can choose any camera or have 4 of them on screen simultaneously!) on site or program the unit to record with motion sensor ability. It even comes with a full featured remote controller. Complete Package: We wouldn't call it a full set if you have to buy extra parts. With the CVNH-I39 everything (cable, mounting hardware, power cords) is included! - Cables: Normal security cameras come with 2 or 3 meters cable, whereas we are giving out 4 rolls of 18 meter weatherproof cables as part of this set. - Mounting Brackets: 4 of them, with light weight durable metal construction. Each has two joints with steel bearing and 360 degrees full rotation so that you can point your cameras to any direction you want. - Power Adapters: 1 for the DVR unit and 4 for each security camera. Universal with extra long cords for more flexible installation. A complete CCTV security system is one that you have around-the-clock and around-the-globe accessibility, and this is exactly what the I39 Surveillance DVR kit offers you. How? when you connect the DVR unit to the Internet you can control it from anywhere around the world. Whether you are just out having lunch at McDonalds or flying half way around the world to attend a business meeting, simply open up your IE browser, you can instantly see who is climbing into your backyard, and also command your security system to capture still images, record video, setup sensor recording, etc. The DVR unit has system auto recovery feature, which will let you continue your video surveillance after a sudden power failure without having to setup the network parameters again. Call to Action: Low price, high quality, and immediate shipment, this item is great for security product retail stores, small business or high-end home security system installers, or general security and surveillance resellers. No matter the customer, this Security Camera + DVR Kit has everything you need for your personal/business security. Don't delay, immediately make your home and business more secure with a system designed for both the "average guy" as well as the "expert" to use. Enjoy peace of mind, add this to your cart now. Playback: Single Channel /4 channels simultaneous ! The cameras are waterproof and thus you can use them outside of your house or office. Supplied Seagate 500GB HDD cannot be changed by supplier. Does the four cameras have audio? No. The camera itself does not have audio. But it is possible to connect external audio to 2 of the 4 cameras. The DVR unit has menu option that allows you to assign audio to 2 cameras when recording. The control and video page can only be viewed under Internet Explorer with Active X enabled. Please switch to Internet Explorer and follow the manual to download the Active X component. What is the System Auto Recovery feature? The System Auto Recovery feature means that after an electric power interruption, the system will automatically return to the state just before the interruption occurs, more importantly, it will resume the Internet connection so you can continue your remote video surveillance without having to setup the network again. The photos show a VGA port on the unit, but you have not listed that functionality on your product description. Can I connect a VGA monitor to the kit? This Kit is sold without VGA connectivity, but it uses the same casing as other more expensive models we don't currently have that do have VGA functionality.